Juan Lagares spent the last couple of weeks of April on the disabled list. He rejoined the team for the series against the Rockies and promptly showed us why he’s so valuable in the lineup. Although Lucas Duda leads the team in OBP with a .361 mark on the season, Lagares is right there with him at .360 on the season. Lagares gets on base around the same amount, but his team-leading .507 SLG outpaces Duda’s .447 mark considerably. That’s because in 22 fewer plate appearances, Lagares has three more doubles and one more triple than Dude; only Daniel Murphy, with 129 plate appearances to Lagares’ 75, has more doubles (8 to Juan’s 7), and Eric Young has two triples to Lagares and Murphy’s one. In fewer plate appearances, Lagares has more total bases than Murphy, Duda, and David Wright – 38% of his hits are for extra bases. 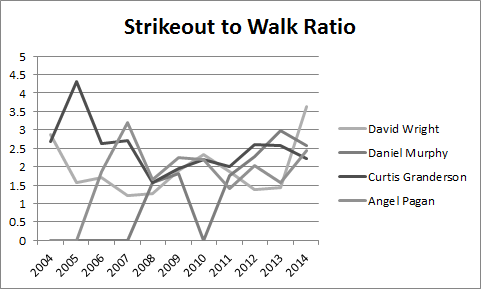 Strikeout-to-Walk ratio appears to contain a strong random element. In fact, Lagares had a great series in Colorado, hitting four singles and four doubles but striking out six times in 20 plate appearances. He does, however, lead the team in KBB – he averages about 6.33 strikeouts for every walk he takes, more than double the league average of 2.72. On the other end of the scale you have players like Travis d’Arnaud and Ruben Tejada (whose plate discipline has been mentioned before on the World’s Worst Sports Blog), who average 1.33 and 1.5 strikeouts per walk, respectively. Moneyball seemed to indicate that it’s tough to teach plate discipline, and taking a look at Murphy and Wright’s numbers seems to indicate a substantial random element in KBB ratio. Angel Pagan and Curtis Granderson also round out the graph at left, which tracks strikeout-to-walk ratio over the past ten years. Is there much hope of improving Lagares’ KBB ratio? Perhaps. Granderson’s spiked up and was on a downward trend for a while; on the other hand, Murphy’s has climbed steadily as he’s improved as a hitter. There are definitely some deeper relationships that merit further investigation.